This simple Elderflower jelly is made using the refreshing and heavily scented, Elderflower cordial. The cordial is one of the most versatile ingredients in the summer kitchen. The refreshing drink is one most people associate the cordial with but is super in cakes and ices. 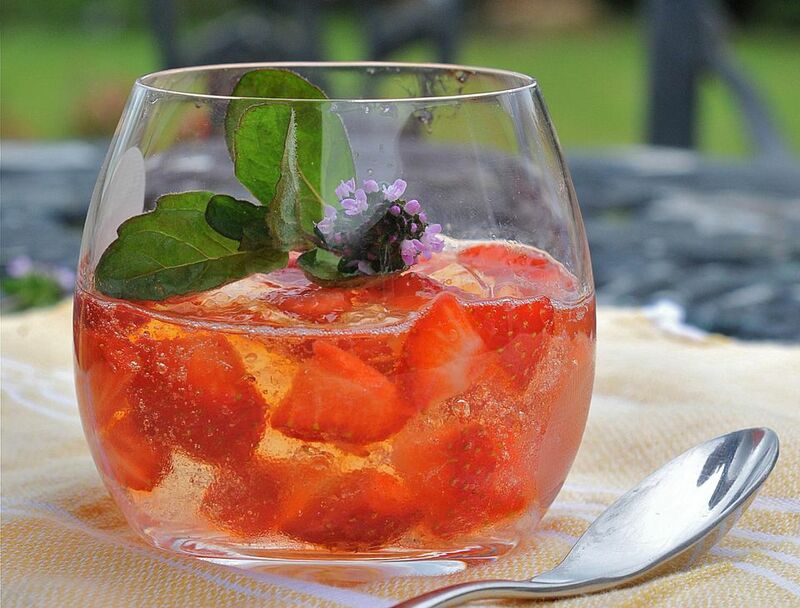 Here, it is turned into a lovely refreshing jelly, perfect for holding summer fruits and given the addition of sparkling wine (champagne if you are feeling decadent). Place the sugar, water, and lemon juice into a small saucepan, and stir. Slowly dissolve the sugar over low heat. Once dissolved, simmer for a few minutes then remove from the heat and leave to cool slightly. Snap the gelatine leaves roughly into small pieces, cover with cold water and leave for 5 minutes. Lift the leaves from the water, squeeze lightly, then add to the warm sugar syrup and stir until thoroughly dissolved. Pour the sugar syrup and gelatine mix into a large bowl. Add the Elderflower cordial and sparkling wine to the bowl and stir gently. Do not over stir or you will flatten the wine. Place the bowl over a bowl of iced water and leave to cool until the jelly is just starting to set which takes about 30 minutes. Stir the jelly from time to time as this will speed up the setting process. Once the jelly begins to set (do not let the jelly set completely, it should be thick and wobbly) add the summer fruits, stir to distribute the fruit through the jelly. Pour the wobbly jelly into glasses or bowls and place in the refrigerator to set, preferably overnight. Serve the jelly with extra fruit and cream or a good quality vanilla ice cream. Shortbread biscuits are also delicious served with the jelly. Leaf gelatine is the more preferred setting agent in making a jelly than powdered. What size leaf is the confusing issue though when working out how much to use. In Britain, a standard gelatine leaf which can be bought in supermarkets is classed as platinum. For a jelly to turn out, use 1 small platinum sheet for every scant 1/2 cup/100ml liquid. For a jelly to serve in a glass, use 1 sheet of platinum for every generous 1/2 cup/125 ml.